Be sure to get to the airport at least two hours early to get your bags checked, get through the security lines, and finally get to your gate. 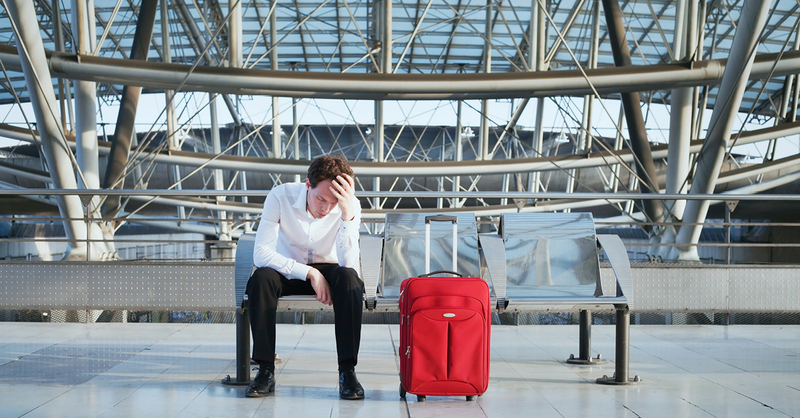 Understand that your plane could be delayed, which could lead to you missing a connecting flight, or at best, make you late to pick up your reserved rental car. Obviously, you’ll need a rental car big enough for your family, your luggage and any supplies you may bring. That would be a large SUV, which costs way more than just renting a small car. Once you’re in your rental car, you’ll need to find a hotel in which to spend your nights. This can be trying to get multiple rooms for the family, especially if you are near a popular destination spot. In fact, even if you get multiple rooms, you may go bankrupt trying to pay for them! Unfortunately, you won’t be allowed to check in until approximately 3:00 p.m. This means that you’ll need to find something to do while your room is being prepared for you. Oh, and on the day you leave, you had better plan well enough to be out of the room by the 11:00 a.m. checkout time. Hopefully, you’ll find a wide variety of restaurants in the area; something that the whole family will enjoy, and that you can afford, as feeding six mouths can get very costly … for every meal on your trip! You should probably have the oil changed, make sure your tires are in great condition, and repair any little things that could turn into big things as you drive hundreds of miles. It wouldn’t pay to break down and ruin the family vacation, unable to proceed with your plans until the part that was special-ordered arrived in whatever small town you end up in. Even more importantly, you’ll want to make sure everything is running properly for the safety of your family, even if it costs a mint to get it in good running order. Now that your car is ready to go, you must decide if you want to leave your kids or the luggage behind, because unless you’re driving a big rig, you don’t have much chance of fitting both into your family vehicle! Be sure to give yourself a lot of extra time to get to your destination. With all the restroom and snack stops you need to make, it can take a while to get where you want to go. Then, there is the fact that you need to eat meals, too. Yep, once again, that gets real pricey, real quick! And then there’s the quandary of where to stay the nights … just like when you rent a car, you’re in for a doozy of a price tag! If you decide to rent a top-of-the-line class C motorhome from Cruise America, you’d better know ahead of time that you’re probably going to get spoiled, and you’ll want to do this again and again! Especially when you realize just how economical it can be! You will probably overpack, as there is adequate room in these units for about anything you’d like to bring, including bikes and barbeque grills. You most likely won’t be eating out at many restaurants, due to the fact that you have a fully-equipped kitchen in your rental RV. Oh, and the snack stops will be eliminated, as you can carry as many snacks as you wish! There won’t be a need for staying in a hotel. When you rent an RV from Cruise America, you’ll be carrying your hotel around with you. You may choose to stay virtually anywhere you want (as long as it’s legal), whether in an RV park or in the wilderness. That’s because each of our rental RVs is self-sufficient, with its own water and waste tanks, along with a generator for your power needs. Also, you’ll never be disturbed by housekeeping knocking on your door too early. Although, you should probably know that it’s common for our RV renters to be awoken in the morning by the smell of bacon and eggs frying in the kitchen. You may over sleep, because you’ll be in very comfy accommodations in which you can sleep as long as you like, with no checkout times! And because everybody has their own bed, you’ll all be able to stay together, instead of having multiple hotel rooms. As you travel in your rental motorhome, you’ll wonder why the kids are being so quiet. You’ll find that they are all comfortable with plenty of space, gazing out the windows at the beauty (compliments of mother nature), or playing their video games, or reading a book. It’s amazing how quiet they can be when they have their own space. And because traveling is so comfortable, you most likely won’t be hearing any questions about when the arrival will take place. In fact, in a Cruise America rental RV, getting there is half the fun!